Prototype: German Federal Railroad (DB) type OOtz 43 and OOtz 50 hopper cars. The cars look as they did in Era IIIa. 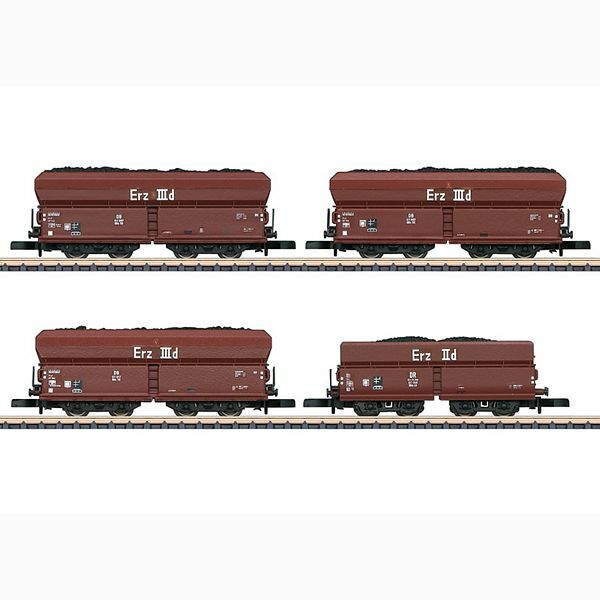 Model: This set consists of one (1) type OOtz 43 hopper car and three (3) type OOtz 50 hopper cars. All of the cars have load inserts of real coal. The car bodies are made of plastic and they are prototypically lettered. The cars have close coupler hooks. Total length over the buffers approximately 210 mm / 8-1/4". Item number 86307 can be lengthened prototypically with item numbers 82803 and 86308 and goes perfectly with the 88962 locomotive.